DIY (do-it-yourself) is the relatively new term adopted to describe any activity engaged in by laymen and even professionals plying their trades after hours. Subjects range from hanging a kitchen cabinet or planting a tree, to a total engine rebuild or building a robot. Reasonable quality and capability tools for performing around-the-house chores are fairly cheap and available for purchase or rent for projects most people undertaking such challenges. Cordless saws and drills, stud finders, airless paint sprayers, and electronic readout levels can be had for under $100. More expensive equipment like branch chippers, ditch diggers, sections of scaffolding, and ceiling drywall hanger's stilts can be rented. Some tools, like metal lathes and CNC milling machines, car lifts, high end and specialized test equipment, 3D printers, acetylene welders, etc., are either too expensive, difficult to obtain, or maybe take up more space that a homeowner or small business has available. For those situations, you can seek out a Makerspace. 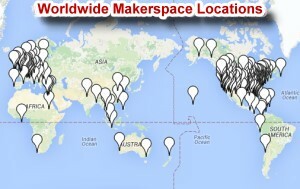 According to the Google map, there are currently 545 Makerspaces located throughout the world. Most are in the U.S., with Europe coming in second. A whopping 5 show up on the African continent, and 6 are in South America. About 20 are in Canada (with one even in Newfoundland). China and Australia each host 2. Even Phnom Penh, in Cambodia, has a Makerspace. No doubt there are similar unaffiliated facilities and groups everywhere, so don't let the lack of a MakerSpace in your area prevent you from seeking out an independent group - or maybe form your own Makerspace. Although I have not yet visited it (I just now learned of it), the Erie Makerspace is in Union Station just a few miles from my house. Many Makerspaces are affiliated with colleges and businesses and are very well equipped. No doubt a big part of Makerspace's success has been due to various media outlets (like RF Cafe) picking up on and reporting their activities, but a large number of Maker Faires are held annually to bring their activities and capabilities to the public. Participation is not limited necessarily to members of the Makerspace community. Images and videos from past Maker Faires shows some amazing art forms and high tech work. The National Maker Faire will be held in Washington, D.C., on June 18th and 19th. A huge collection of my 'Factoids' can be accessed from my 'Kirt's Cogitations' table of contents. All pertain to topics that are related to the general engineering and science theme of RF Cafe.